Cliff Fragua (Jemez Pueblo). Image courtesy of artist. Anyone who desires to learn the traditional practices of stone carving is never turned away. For Cliff Fragua, stone carving has its place in Jemez Pueblo culture. It remains a vital part of their ceremonies. “Teaching others how to carve stone for their own use is another way of passing on traditional cultural knowledge,” he says. He’s been asked why he shares his skills. To him, it not only helps the individual economically, but also moves the community to another level when they gain knowledge of the art form. 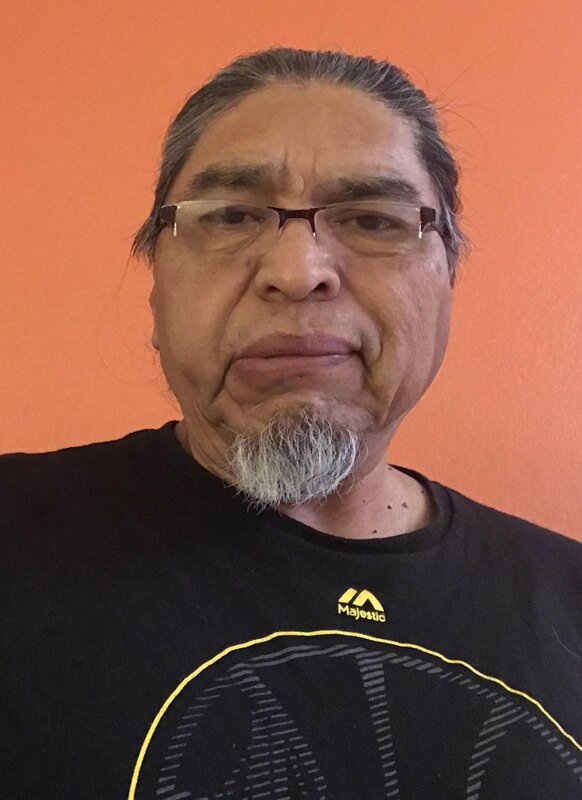 Over the past 40 years, Cliff has demonstrated his dedication to helping Native artists, whether through his award-winning art, committee and volunteer work, or teaching. In 1990, he was instrumental in founding the Towa Arts and Crafts Committee, which evolved into the Jemez Arts and Crafts Association. Cliff saw the need for such an organization early on to help local Jemez Pueblo artists. The association provided venues and shows for artists to sell their work, creating an art economy so they could provide for their families. Now he helps other Indigenous communities set up their own associations. 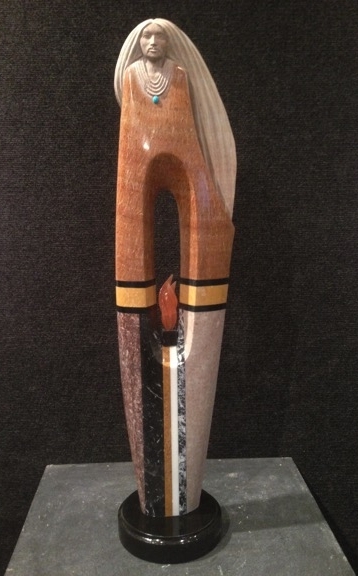 Chris Pappan (Kaw) chose to nominate his fellow artist for the Community Spirit Award because Cliff immerses himself in the cultural practices of the pueblo and the ways of his People, expressed through his sculptures. “This deep sense of responsibility to sustaining the arts of Indigenous people is just one of the many reason I supported the nomination of Cliff Fragua,” said Chris, a ledger artist in Chicago and former First Peoples Fund Artists in Business Leadership fellow. Paddling Down Mystic River, Connecticut on Nikomis' maiden voyage with an Intertribal Native boat Crew: Aquinnah Wampanoag, Shinnecock, Mashantucket Pequot and Schacticoke, August 8, 2015. Traditional singer, dancer, speaker and carver, Jonathan James-Perry is grounded in the traditions of his oceangoing ancestors. His vessels bring the community together. One of his projects, Mission Mishoon, became a community center with feasts created on the fires that burned diligently in the vessel as it was created. The community shared traditional foods — roasted whale meat, wild rice, turkey, venison, buffalo, bear, fish, mussels and the occasional doughnut. Jonathan James-Perry (Aquinnah Wampanoag). Image courtesy of artist. Laughter, memories and prayers came together with people from the Aquinnah and Mashpee Wampanoag communities and brought in people from the Narragansett, Pequot, Mohegan, Passamaquoddy, Hunkpapa Lakota, Crow, Haliwa-Saponi, Navajo, Shinnecock, Cree, Apache and many other Nations. Visitors brought pieces of their communities to the boat, and those gifts are now the vessel’s existence. “All the vessels that I have made have been paddled and cared for by people in our New England Woodlands communities and Native-owned-and-operated museums and cultural centers,” Jonathan said. Elizabeth James-Perry, Jonathan’s sister and an accomplished artist, sees how Jonathan strengthens the Aquinnah tribal community through showing how Aquinnah Wampanoag people still exist in their homelands against the odds. In Lakota tradition, the gift of a buffalo robe is considered a great honor, second only to receiving an eagle feather. 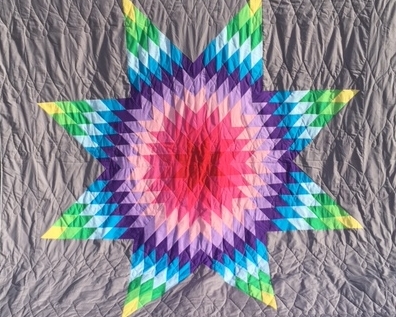 When the government and settlers destroyed the buffalo herds, some women replaced the buffalo robe with handmade star quilts. Taught at a young age by her mother, Norma Blacksmith has been a self-employed seamstress and quilter since 1986. 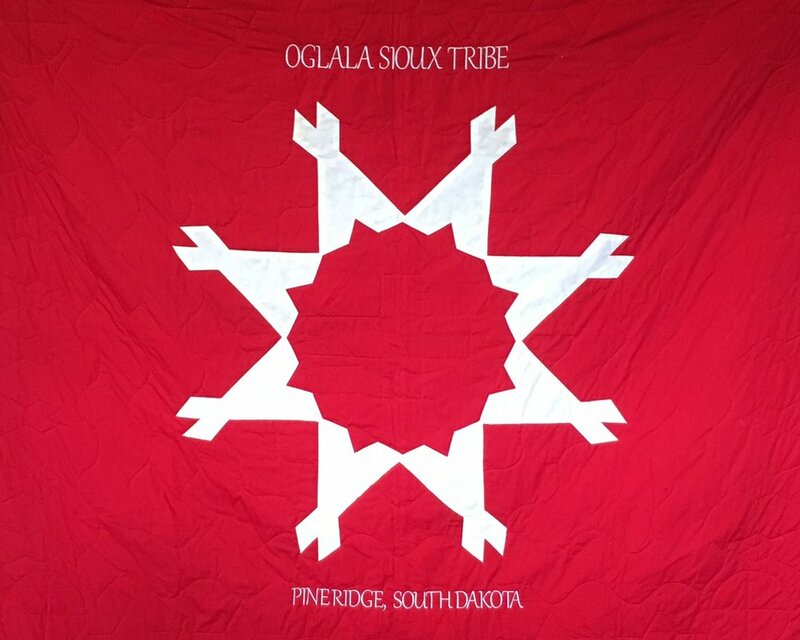 In 1987, she approached the Oglala Lakota College with the idea of teaching students how to make star quilt tops as a Lakota traditional art. The board accepted the suggestion, and classes were presented to people in the community interested in learning the art form. Norma Blacksmith (Oglala Lakota). Image courtesy of artist. In 2011, with the help of Bruce BonFleur of Lakota Hope Ministry, Norma moved her business out of her home and opened Native Quilting Shop, a lifelong dream come true. A highly respected elder in her community, Norma honors others by wrapping them in star quilts and singing songs over them. She honors people in all walks of life — men or women released from prison to Vietnam veterans. Chumash Basket for Storage of Ceremonial Plants by Timara Lotah Link. Timara Lotah Link is one of California's preeminent weavers. A generation younger than many of her weaving counterparts, she has dedicated her life to learning, reviving and teaching California’s oldest and most rooted arts in her Chumash community and broadly to Native Peoples throughout California. Timara Lotah Link (Chumash Coastal Band). Image courtesy of artist. She makes baskets, fish traps, bows, seed beaters, headdresses, cradles, boats, traditional houses, dolls, hats, jewelry, regalia, musical instruments and canoe paddles. Each new skill she obtains is a small piece of her culture she can return to her community, though proximity to one another is her People’s greatest challenge.